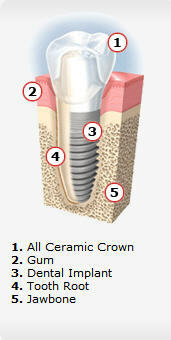 Dental Implants are small fixtures that take the place of the natural root of the tooth. Dental Implants are small titanium “fixtures” that take the place of the natural root of the tooth and are gently implanted into the bone using local anesthesia. These very tiny titanium roots actually bond or integrate with a patient’s bone, more securely than natural root would. Often an osseointegrated dental implant placed by your dentist is more stable than a natural tooth’s root. Upon these implants, we can build permanent teeth, custom designed and shaded to esthetically suit each patient’s distinctive facial requirements. Missing teeth have unique demands. The challenge is to replace your missing teeth with appearance and function, without harming your remaining teeth or gum tissue. Below are some common questions & answers about dental implants. Please feel free to contact us to learn more about a dental implant consultation or take the time to request an appointment online. A dental implant is a small titanium screw that serves as the replacement for the root portion of a missing natural tooth. Dental implants can be placed in either the upper or lower jaws. Due to the biocompatible properties of titanium, a dental implant fuses with the bone and becomes a good anchor for the replacement tooth. Dental implants can be used to replace single or multiple missing teeth. Occasionally, older patients express concern that their age may prevent them from enjoying the benefits of dental implants. Health is more of a determining factor than age. If you’re healthy enough to have a tooth extracted, you’re probably healthy enough to receive dental implants. Certain chronic diseases may contraindicate dental implant treatment. Your dentist will determine if your a candidate for dental implants after careful evaluation of your dental & health history. Improved appearance—When you lose the entire tooth – crown and root – shrinkage of the jawbone may cause your face to look older. Dental implants can stop this process. A traditional denture or dental bridge doesn’t. Preserve natural teeth—With traditional dental bridges, teeth adjacent to missing teeth are normally ground down to be used as anchors for a dental bridge. Dental implants often eliminate the need to modify healthy teeth. Permanent solution—There are no loose parts to worry about losing. The dental implant is stable and comfortable. No adjustment is need after placement. Normally, it will serve its owner for life. The procedure chosen depends on several factors, such as your dental health, the number of teeth involved, and which teeth are replaced. These factors will also determine the total number of visits to the dentist throughout the treatment period.